The E-3 is an efficient, immediate and precise embosser, perfect for single sheet certificates, diplomas and legal documents. The trigger mechanism can be set to the same confident depth, and a guide shelf is available for perfect positioning every time. 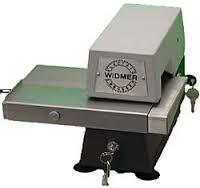 Stamping pressure can be adjusted with ease electronically so that the dies do not cut through the document.